Choosing a suitable topic within the instructions of a writing or presentation assignment is often a significant first step. Searching for information related to a topic too broad in scope can uncover an overwhelming amount of articles and books. A topic too narrow might be challenging due to the absence of related published sources. Select the tabs below to learn more about identifying a topic. 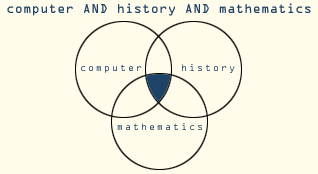 Check a subject encyclopedia for ideas and concepts. The Gale Virtual Reference Library and Credo Reference collections offer hundreds of subject encyclopedias. Do some exploratory searches in an article index such as EBSCOhost's Academic Search Premier. Look at the abstracts or summaries of articles that interest you; they may give you ideas for topics. If you have a question about whether your chosen topic is appropriate for the assignment, check with your instructor. Librarians can then help connect you to information related to that topic. College-level writing is different than high school writing, especially in English 111. Instead of just reporting on a topic, you will be required to explore thoughtful questions about your topic. Try writing your topic as a question. A research question seeks an answer. It directs your research because you'll be more likely to spend your time working with sources that will help you answer the question you've posed. Let's say your topic is "marketing" and you have decided to narrow the topic to the population "women." Can you imagine how many sources discuss marketing and women? Tons... and that's not helpful! You could spend hours looking through the sources that matched your search. You couldn't get by with just pulling the top ten sources, either. Your sources would be on too many different aspects of the topic, from "women in advertising" to "advertising to women." In other words, your research wouldn't have a focus. But, if you ask a question before you begin researching, such as, “How do advertisers market products to women?” you'll only look for sources that answer your question. What am I trying to find out? What will my research prove? What answers am I searching for? Try using one of these question starters to formulate a research question of your own. What characterizes women who achieve successful careers in advertising? To what extent does education level influence marketing techniques used to reach women? When you use a search box for a library catalog or a journal database, there are usually a number of search type options. 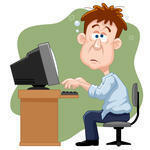 Keyword searching allows you to search multiple fields of a record at the same time. This is helpful if you know your topic, but aren’t really sure what you are looking for. Author searching and title searching are helpful ways to focus your search when you know the author's name or a book or article title. 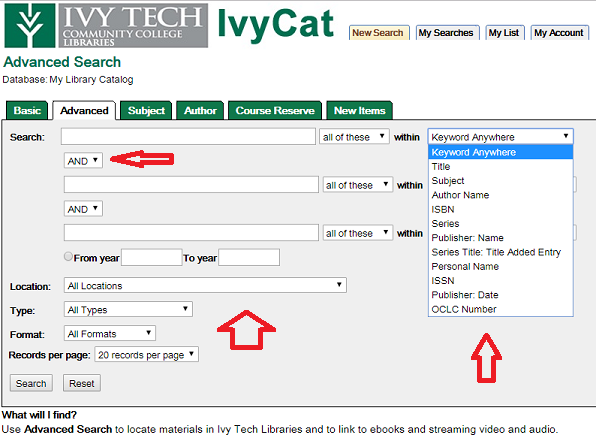 Most search tools for library catalogs (like IvyCat shown below) and article databases have additional advanced search features, such as setting a publication date range, allowing you to focus your search even further. 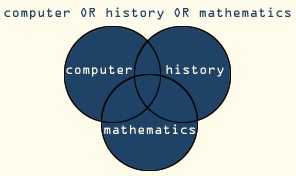 A common way to focus your search is to combine more than one keyword in a single search – for example, “computer AND history AND mathematics.” Connectors – Connector words like AND, OR, and NOT allow you to combine two or more search terms. These are sometimes called Boolean operators. AND – Narrows a search so that you get fewer records. Use AND to combine different concepts in one search. The shaded area in the diagram indicates the records returned would have all of the terms in the search. OR – Broadens a search. Use OR to link together related concepts or use synonyms to cast a wider net and get more "hits.". The shaded area indicates that the OR operator would return all records with one, two, or all three of the search terms. NOT - NOT narrows a search by excluding words or phrases. Use NOT to eliminate sources that aren’t relevant to your topic. 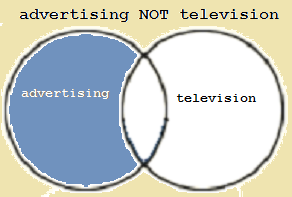 The example below shows a search in which the user wants information about advertising but is not interested in articles about advertising that mention television. Records of articles with the search term "television" would not be included in the search results. Truncation: Truncation works like a wildcard. When added to the stem of a word, the truncation symbol allows you to find that stem plus anything that comes after it. The symbol used to truncate a word depends upon the search tool you are using. Sometimes several symbols are used in the same database for different kinds of truncation (*, ?, !). Examples: The term psychol? will return records that include the words psychology, psychological, psychologist. The term environ* will return records that include the words environment, environments, environmental. Nesting: Nesting keeps concepts that are alike together and tells a database or search engine to search the terms in the parentheses first. Use parentheses to group concepts when you use two or more connectors. alcohol AND (adolescents OR teenagers) This search will retrieve records on alcohol and adolescents, as well as items on alcohol and teenagers. Here's a graphic rendition of the search terms Ivy Tech students have used with Discover! an informal quiz of your understanding.